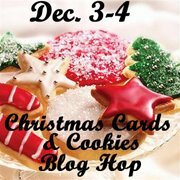 LadyLuvBug: "Christmas Cards & Cookies Blog Hop"
There was so much response to the Christmas Cards & Cookies Blog Hop that it had to be split between two weekends. This is Round One and begins Saturday, Dec. 3rd, continuing through Sunday, Dec. 4th. Round Two will be held next weekend. We have a talented group of women who love paper crafting and baking. Each of them is sharing a recipe for a yummy Christmas treat along with a Christmas card or tag. Hopefully, you’ll pick up some great ideas for your own Christmas gift giving this season. So, grab a cup of coffee, sit back, and enjoy! The treat that I chose to share with you all today is Zucchini Bread. The recipe was given to me by my mother-in-law where she got it I don't know. It has become a all time family favorite. I usually bake at least a 1/2 dozen every year between Thanksgiving and Christmas. to share with family and friends. This one is slated for my youngest sister Her birthday is Mondayand she loves Zucchini Bread. I've included a picture of the original recipe in my mother-in-law.s handwriting and as you can see it is well worn and barely able to read it. This is a copy I made a few years ago and keep it in a plastic page protector. And here it is all wrapped up and ready to give to my sister. The tag was quite easy to make I used My Creative Time's X-tars Large label die and the coordinating boarder stamp and the sentiment stamp as well. The red ink is studio G and the cardinal image is from Inkadinkabo. A little cellophane to wrap it and a piece of red satin ribbon to finish it off! Just a little FYI for those who would like to try this It says bake for 1 hour but it usually takes longer maybe 15 min or so. I hope you are enjoying the hop and will try this recipee You will love it! Thanks so much for stopping by! Please be sure to visit Carol's blog next to see what she has to share with you! Thank for stopping by I hope you enjoyed my post. All comments are appreciated! YUMMY!!! Since zucchini bread is made from a veggie, it's GOOD FOR YOU, right?? That means I can have a slice for breakfast, with a little cream cheese, maybe? OK, send your address, I'll be right over. Cute tag too!! It looks yummy Janet - how do I get on the list to get one??? Your treat looks delicious. My mom makes Zucchini bread every year at this time. Thanks for sharing it with us. Merry Christmas! I love how you packaged this, thanks so much for sharing. yummmm, I used to make zuchinni bread all the time, I don't know why I haven't made it in so long... I have to make this again... I love to put whipped cream cheese on my slice! TFS! Janet, I just love this and have some of my Nanny's recipes that I cherish! That cake looks yummy. Want to send me a piece . The tag is awesome and I may need to try it! So glad to be in this hop with you! Great tag and great idea to do zucchini bread in a bunt pan! Sorry I'm so late in hopping but I just got my computer back.